Gospel means “proclamation” and this movie does a good job of that. Launched by The Lumo Project and distributed by Netflix this is one mesmerizing movie in a 21st century format. According to Vincent M. Smiles at St. John’s University, “The Gospel” was not originally a book or even a creed, it is a confession, known as a way of life, something we do more than something we have. 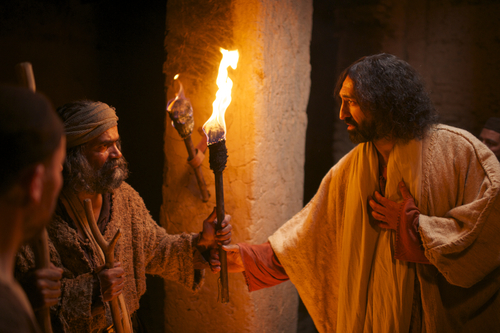 The Gospel of John movie is an effective medium to show “the way of life”. 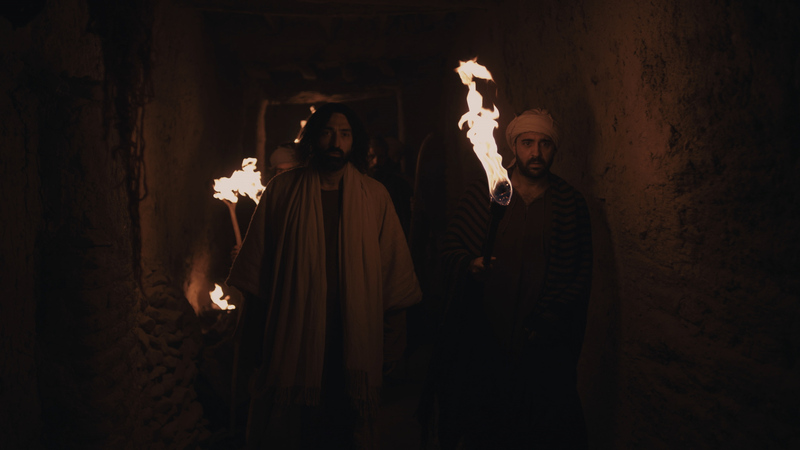 The actors speak Aramaic in the background, the original tongue of the times, while the story is told entirely by the narrator, directly from scripture, word for word! The movie really opens another dimension to the storyline, with fresh images of the day filling the screen. It was filmed in Morocco and took five years to make. The Gospel of John I viewed on Netflix (on Apple TV) was the King James Version narrated by Brian Cox. There is another version, of the same movie images, narrated by David Harewood using the NIV (New International Version) bible from director David Batty. Narration is also available in Spanish and I believe Chinese. One of the high priests in a debate. The Lumo Project is also planning to release shortly the remaining three individual Gospels of Matthew, Mark, and Luke. So we have more to look forward to in 2015. 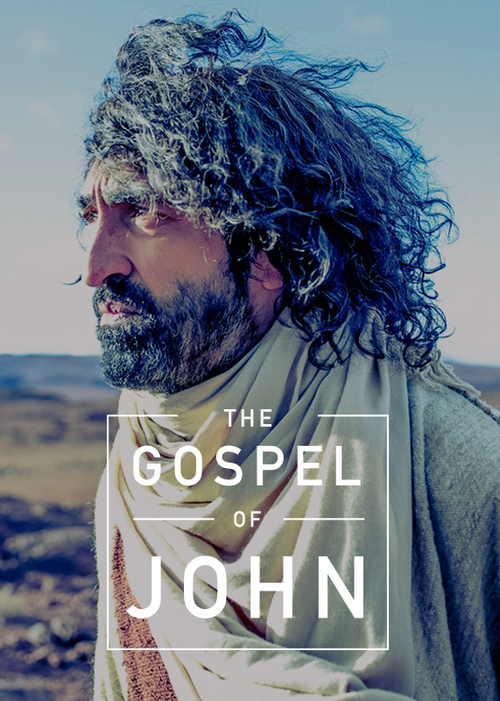 The IMDB rating for The Gospel of John is 8.6/10. In the movie, the shrines of the day were accurately depicted, showing the massive temples and synagogues in the center of town. Also a persons house could be a sacred place for prayerful worship where small groups would gather in the precursor to the modern Church. Jesus on the right, in dialogue with Peter. Although both biblical texts of the movie are streaming on Netflix, my favorite is the Brian Cox narration of the King James version, with the English accent. It’s a long movie, just under three hours, so it’s best to view in multiple sittings to get the most out of it. IMHO. Note: There is another unrelated Gospel of John movie released in 2003, using a more conventional movie format with the actors in English dialog. It is directed by Philip Saville and available on YouTube. Its IMDB rating is 7.7. Thanks! I look forward to seeing this. Most welcome. Hope you like it! The 2003 movie with Christopher Plummer narrating, and actors acting the parts was phenomenal. The best portrayal of Jesus that I have ever seen. There is a Gospel of Luke on youtube in Aramaic (in the background with a narrator reading the scripture. Thanks for sharing. I have seen parts of the 2003 movie and it does look interesting! Have yet to locate the Gospel of Mark movie you referenced. Will keep an eye out for it. Thanks. It is based on the Gideon bible. It is NOT the Gospel of John by Lumo Project highlighted in this blog post. That is only available on Netflix streaming since no DVD is out yet. The DVD will be released in December 2015 and will also be available in iTunes in the USA. Currently the movie is available to rent or buy on iTunes UK. Hope that helps. I came across this sight after doing a search for “why was Gospel of John 2015 movie removed from Netflix? I have watched it several times and went to watch it again and it is gone from Netflix!!! I plan on buying it but still wonder why it was removed? Maybe too authentic for our liberal culture? ( I prefer it in KJV or ESV) Mercy Rule by Kirk Cameron was also removed. Why? Does anyone know? They leave all of these horrid renditions of the Bible with “hair model Ken doll” playing the Christ…..I’m running out of things to watch…that’s OK plenty to read…. Lumo project..Thank you! Well done good and faithful servants! This is a great review. I look forward to seeing it. Thanks for the introduction.